If you’ve ever wanted to spice up your iOS device’s e-mail messages with a little styled text, you’ve run up against one of the limitations of Apple's mobile software. But if you’ve got proficiency with the Markdown markup language—invented by Daring Fireball’s John Gruber—then you’re in luck, thanks to Second Gear’s new MarkdownMail app. For those unfamiliar with Markdown, it’s an easy way of creating styled text just by using certain plain-text characters to indicate special formatting. For example, all text surrounded by asterisks is rendered as italics: *exciting* would be rendered as exciting; all text surrounded by **double asterisks** shows up as bold; links are accomplished with a combination of square brackets and parentheses, and so on. MarkdownMail lets you compose messages using Markdown’s styling syntax, then converts it into HTML format, which most e-mail clients can read. MarkdownMail even provides a handy in-app syntax guide in case you, say, can’t remember how to make bullets. Once you’ve written your missive, you can preview it in its full glory before sending it off. 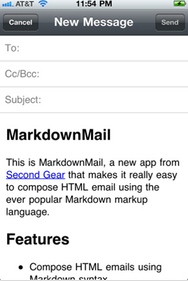 MarkdownMail also features support for TextExpander touch and comes with free customer service via e-mail. The app requires iOS 4 or later running on an iPhone or iPod touch and costs $2.